Access to NW Canal Street from 2nd Ave. NW will be closed into November. Crews will be connecting the new City of Seattle Combined Sewer Overflow (CSO) drain pipe to the existing city sewer system, which runs under 2nd Ave. NW. 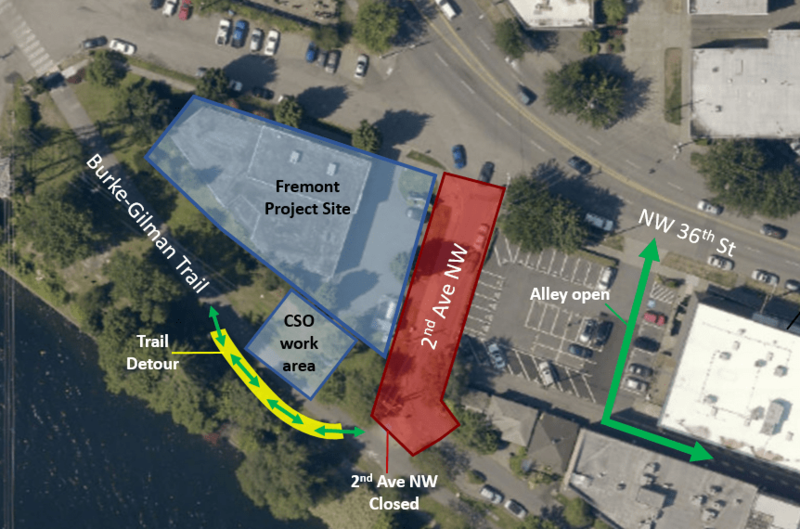 Local traffic and deliveries can access the alley north of NW Canal St. through the parking lot just west of 123 NW 36th St. Burke-Gilman Trail users should follow the trail detour just south of the normal trail to get around the Fremont Canal Park work area safely (see map) . Access to the alley behind NW Canal St.available through the parking lot west of 123 NW 36th St.